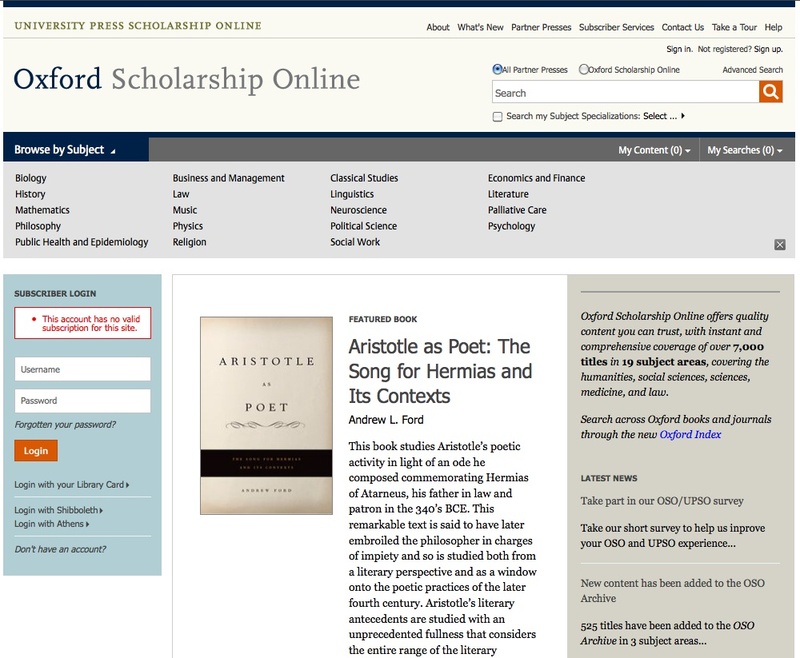 Oxford Scholarship Online (OSO) is a cross-searchable library covering material in the areas of Economics and Finance, Philosophy, Political Science, and Religion. Managed by the Oxford University Press, this site provides access to the complete text of over 6,500 carefully-selected books, with at least 200 new and recently-published books added each year. Full access is provided exclusively to institutions for a one-time purchase fee or annual subscription, with free trials available to libraries worldwide, while abstracts, bibliographical data and keywords are available free of charge to any user. Many bibliographic cross-references are also available, pointing to other Oxford publications and online resources. By offering extensive reference linking to individual chapters, along with printer-friendly format and other useful inquiring options, this reference service provides an effective interface. In September 2011 the OSO website has been renewed. In addition to the new look, new functionalities and access to new content have been introduced, through the OSO archive and from the new University Press Scholarship Online (UPSO) platform, which offers more than 7,000 titles available.